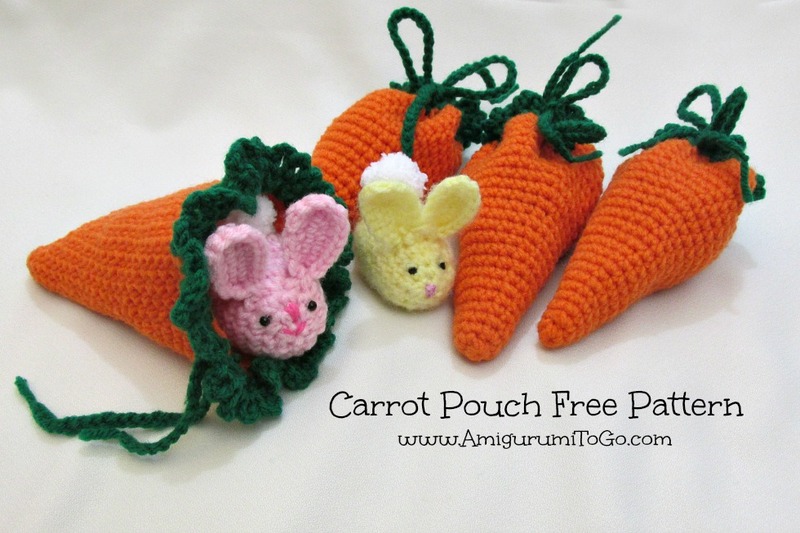 Here's a great little gift idea for the little ones this Easter! I designed this one to hold one Easter Egg Bunny and there's still room for some treats too. But of course you can make this cute little pouch anytime of the year and stuff it with some fun foods for your child's lunch or to take to daycare with a healthy snack inside. My children always loved their snacks inside something fun and colorful. video tutorial as well. Keep scrolling down this page for the pattern and video link. Add a maker at the end of row 2 and move that marker each time you finish a row. Each row has a sequence. Example: 1sc then 2sc in next st means repeat that sequence 1sc then 2sc in next st followed by 1sc then 2sc in next st over and over to the end of that row. When you land on the marker you should be putting in 2sc. The number inside the parentheses ( ~ ) is the number of stitches you should have at the end of that particular row. 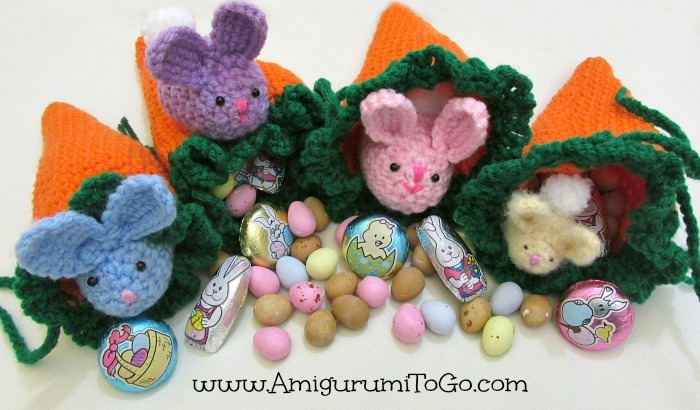 Many parts of this amigurumi begin with a magic ring. I have 2 short video tutorials that will show you 2 different methods of making a magic ring. Use the one that is easiest for you. View 1st method here and 2nd method here. With green ch 80 and f/o. I switched to a 3.75mm hook to make the chain. This isn't necessary but it will make a tighter looking chain. Weave chain in and out between the posts of row 25 all the way around. Thanks for a great, quick and easy pattern for an Easter gift! Thanks, this is so sweet! Lovvved this...quick and easy!! Made 6 for the kiddos in my life!!! Love,love lovethis!!! Thanks again Sharon for yet another amazing pattern!! I loved this pattern from the minute I saw it and can not wait to make them for my grandchildren. BUT I had a major problem finding orange yarn. I finally found it in AC MOORE after going to 4 other craft stores.Michaels told me it is an unusual color and not part of their normal inventory. What???????? I got the yarn this morning and plan on crocheting at least one today. I am so excited! Me encanto el patron .Lo vamos a realizar con mi mama para la proxima pascua de Resurreccion.Si Dios asi lo permite. Thank you so much for this pattern and tutorial. I just finished making it for my daughter as a surprise for Easter. It is soooo adorable! She will love it. Going to make the bunny next. Also looking forward to exploring your site and checking out all your other patterns. Thanks again! Love this, making them for grandchildren and co workers for Easter. Thanks for the easy to follow pattern.